We’re halfway through 2018 and just when I got over newly released phones and other gadgets including voice command speakers (smart speakers) and tablets, I was wondering how the uncovered technologies are going to boost in upcoming year 2019! Being a tech worm, my mind always takes heed to automation. How tremendously our lives have been changing since decades, how the latest technologies have been affecting our lives, helping us for a better communication and making distant relation close. These technology trends are capable enough to make our interactions better and stronger. There has been a lot of up gradation and advancement to several technologies that promised us the same and there’s no end to it, ever. The world has been changing because it has millions of great minds working in the field of science, changing the world to a better place. So, the biggest question! What are the uncovered technologies that topped the tech news this year? Have you been aware of the latest technology news that will change the way you think? Artificial intelligence is a science that is focused on creating intelligent machines which would do things that are usually done by humans with our natural intelligence, it basically is a program in which a machine can do various kind of intelligent works (which is usually not possible for a computer) like, thinking, problem-solving, reasoning, ability to manipulate objects etc. The first idea of AI was contrived by Jay McCartney in 1956 at a conference in Dartmouth College, US. The conference had a huge influence on the scientists of succeeding generations to work in the field of information technology which would serve us humans in a fervent way.  Encouraging greater functions of a human brain.  Programming a computer system to use a universal (common) language.  Arranging of theoretical neurons in such a way that they can form ideas.  A method to determine and measure the complexity of a problem. This AI technology is used in the self-driving cars which are being developed by tech giants like Google, Uber etc. Teen Driver Technology is also one kind of technology which is introduced by Chevrolet which assists your teen by helping him/her to drive the car in your absence. Blockchain is a continuous record of enumerations, called blocks, which are connected and kept unharmed using the method of cryptography. All the blocks contain a cryptographic hash each of the former blocks, a timestamp, and data of the transaction. A Blockchain is designed in such a way that the data in it cannot be modified. If it needs to be altered then the data in subsequent blocks requires to be altered first, which needs an agreement of the network majority. It is a special kind of database. It is one of the latest tech in crypto and also one the most discussed technologies in the Silicon Valley. Blockchain’s unchangeable log allows trustworthy and authentic transactions that are executed with very little processing charge. The blockchain is used for a variety of applications, such as tracing proprietorship or the administrative division of documents, digital assets etc. Moreover, this Blockchain technology is expected to boom like anything in 2019 when compared to other technology trends. The Internet of Things (IoT) is a network of various physical tools, vehicles, home appliances and other things that are implanted with electronics, software, sensors etc which gives these things the authority to connect and exchange data. The IoT is capable enough of changing our lives, its impacts has just been started and will have major transformations in coming years. Since it is a new technology, IoT can be perplexing and a menace at times which leads to a lack of consistent standards. But they’ve been working on it and will fix the problems soon. Smart homes, Industrial internet, smart city, connected car, wearables. are some of IoT’s most appreciated uses which have helped IoT to reach higher rankings in the tech news and market. IoT tools are a part of the higher concepts of home mechanization which includes air conditioning, heating, security systems etc. It creates good chances for more concatenation of physical world into computer systems. This results in improvises the productivity and effectiveness serve monetary benefits and reduces exertions faced by humans. Virtual reality is a mutual experience generated by computer in a restorative surrounding that includes auditory, visual and other types of sensory response. VR technology usually takes virtual reality headsets in use or sometimes multi-projected environments; it can also use a combination of both. The props used by VR headsets are used to generate realistic images, sounds and different sensations that excite a person’s physical presence in an imaginary environment. A person who is using virtual reality tool can explore, pursue and can move around in it, he/she can also communicate with virtual items in the VR. The effect is created by VR headsets consisting of a display that can be mounted on the head which has a small screen right in front of the eyes, but not only this, VR surrounding can also be developed in specifically designed rooms with numerous large screens. It can be used in the development of new models, communications, training etc. Without confusing with the Virtual reality, let’s talk about Augmented Reality. Augmented Reality (AR) is a collective experience of a real-world environment with augmented elements by computer-generated non-cognitive information. Augmented reality superimposes videos generated by computer system onto a video captured by the camera in such a way that the 3D computer graphics (CGI) comes into sight where it has an outright location in the real world. Big Data is a huge collection of data and yet growing epidemically with time. Big data is so large and complex that no conventional management tools are capable of storing it or processing it efficiently. It is a data set that is commodious and complex. The conventional data-processing application software is not enough to deal with them. Big data includes capturing of data and its analysis, visualization, updating, querying, transfer information privacy etc. Big Data is a way to solve problems related to data handling& management. Apache Hadoop, NoSQL, Sqoop, are some of the big data tools. This Big Data technology will play a vital role in helping the talent acquisition team to hire top talents available in the market. 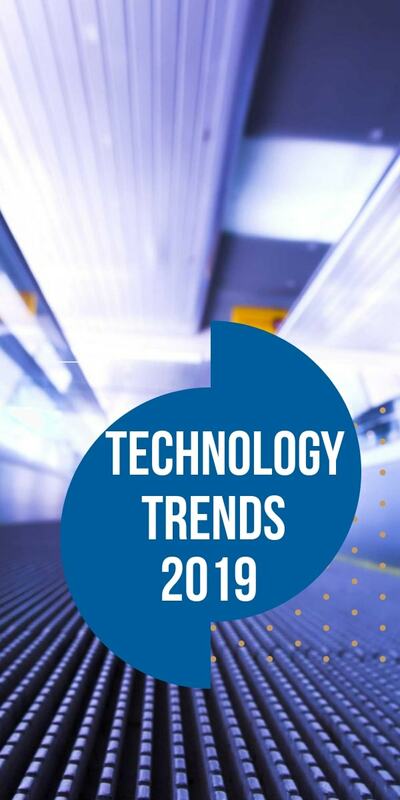 The above-mentioned technologies, you will see these making headlines in the latest technology news of 2019.